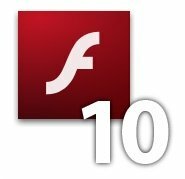 I wanted to install flash player 10 because flash player nine kept crashing on my Ubuntu 8.10 installation. So I found a nice howto on google an followed it. The article explains how to install it on a 64 bit installation of the Ubuntu operating system. The howto worked fine, but flash kept crashing. I think it has something to do with the nspluginwrapper package.